Interface where you can define the ScriptCase settings. All the users have access to this section, and the changes done are tied to the login(user) that you are currently using. This way each user can have their own settings for ScriptCase. Language - Scriptcase’s interface language. When informing the language in My ScriptCase, the selected language at the login won’t be considered. Security Resources - When unchecking these options, the security settings won’t be considered when running the applications in the development environment. When deploying the applications, they will respect the security settings normally. Initial Information - Defines the information that will be displayed on the application listing. Show Friendly URL - Defines the display of the field to inform the Friendly URL in the application. 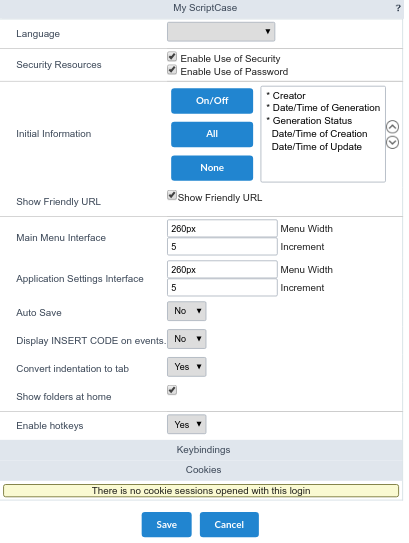 Main Menu Interface - Defines the width of the left side menu of the home page, where the applications are listed and the option of incrementation. Application Settings Interface - Defines the width of the left side menu of the applications settings and the option of incrementation. Auto Save - Allows the modifications to be saved automatically. Display INSERT CODE on events - Defines if the examples will be displaying in the events of the applications. Convert identation to tab - Allows to use “tab” hotkey to indent your code or line selected. Show folders at home - Allows for the subfolders to be listed with the applications, when selecting a folder on the side menu in the home of the project. Allow Hotkeys - This option allows to enable/disable Scriptcase hotkeys. Click Here to view the hotkeys list.